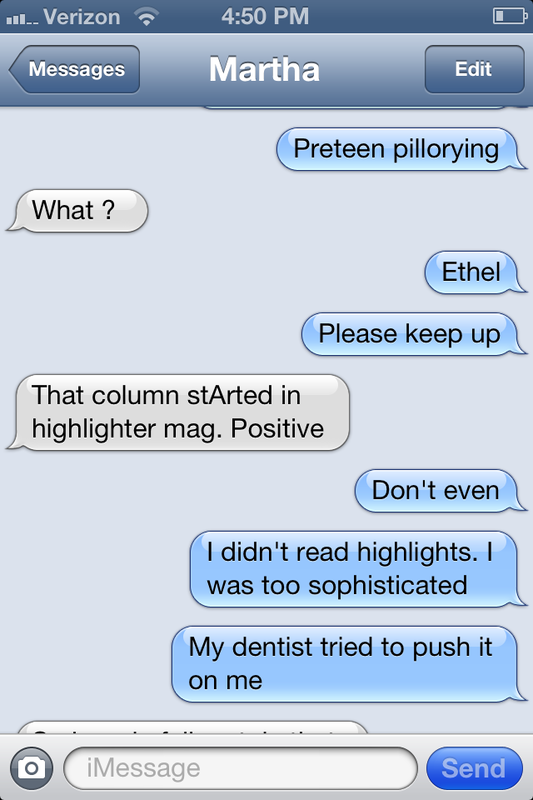 Yesterday Martha Frankel and I were in the midst of one of our texting flurries. I made a joke, and her usual cryptic response led me to think she didn’t get it. I spelled out the joke again. She let me know she’d gotten it the first time. “Was my face red!” I texted back; smiling at my reference. What followed was one of our typical arguments. 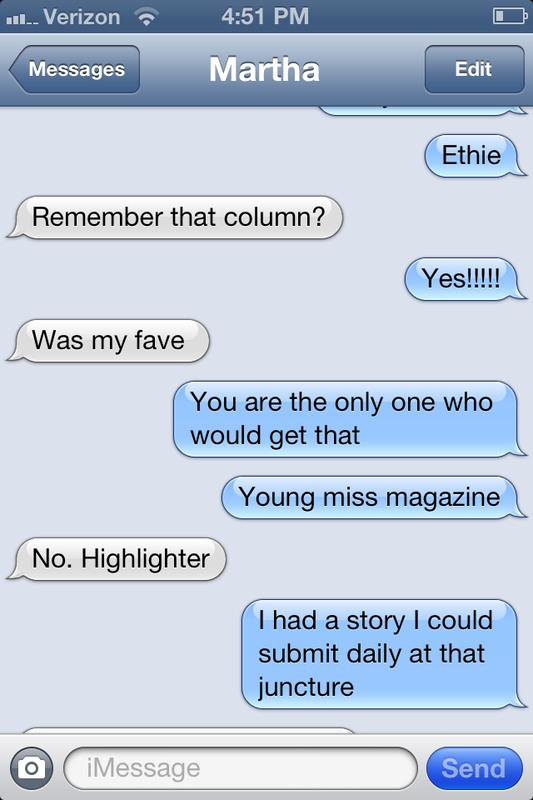 Just ignore the fact that she keeps calling Highlights “Highlighter.” That’s for another day. So I googled it. As usual, we were both wrong. It was from Calling All Girls, which I’ve blogged about before. Courtesy of Jane Marie at The Hairpin, here it is. This will take some of you way back. OMG. As I read these, it dawned on me. This is the original Facebook, people! We’d wait each month to read these. Often it was the first page I’d turn to when I got my hands on the new issue. I drafted so many versions of my own stories to send, but I never did. And now…some of us post our embarrassing stories daily on Facebook. Daily is a lot better than waiting a whole month for them, and then not even being able to interact with the people who wrote them. I always sort of had my doubts about whether girls like Patty Crain, Ambridge, Pa or Babs Layman, Hagerstown, Md were legit. Why weren’t any of these red-faced girls ever from Iowa or Nebraska? Always from the northeast. I pictured some sniffly guy named Murray sitting at a desk in a tiny windowless office typing these things while nipping from a bottle of Scotch. Maybe that’s one of the reasons I like Facebook. I love reading funny things people are up to. I like to share my own funny stories. Sure, Facebook is a lot more than that. But most of that stuff is hidden or ignored in my news feed. I gotta go. 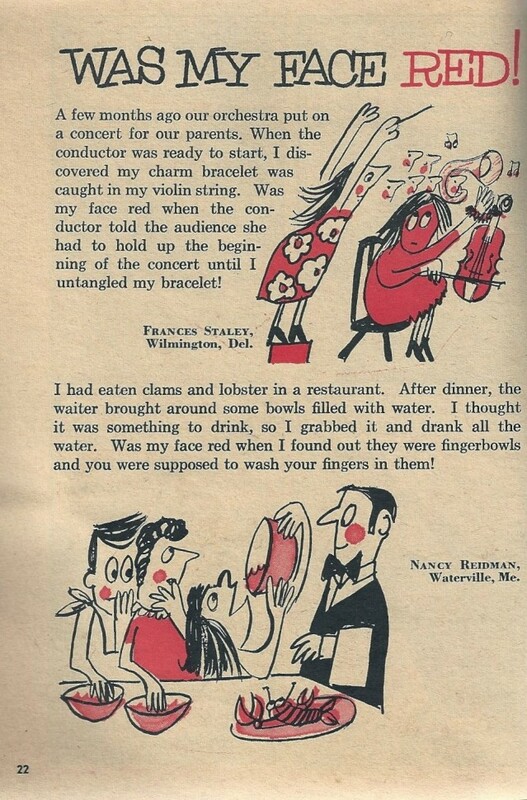 I have to stalk Nancy Reidman, Waterville, Me on Facebook and see if she’s still doing shots from fingerbowls. I don't know that my face was ever red, but I sure did curse a lot when I would mistakenly put a dim or nickel in the penny slot. Holy cow, I had completely forgotten about Young Miss! 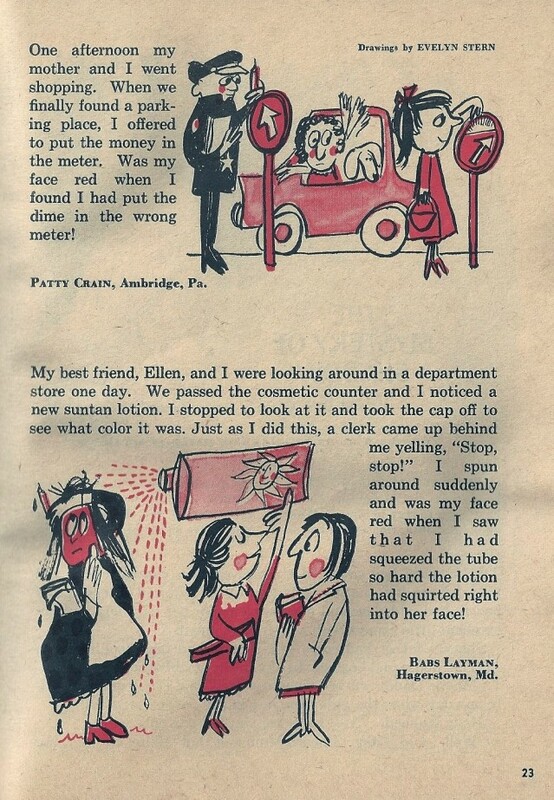 I used to check it from my elementary school library every month along with Cat Fancy magazine. “My dentist tried to push it on me.” Made me snort! The pictures also make me miss Highlights.